Variations of the colors on the inside of an egg can be due to many factors. Use the guide below to determine which eggs to keep and which eggs to discard. 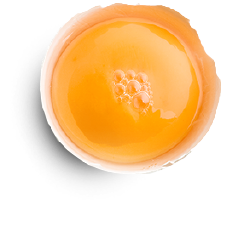 Cloudy egg white – indicates the egg is extremely fresh. Dark yellow yolk – an indicator of the hen’s diet. Hen’s fed lighter color feeds like wheat and barley produce eggs with lighter color yolks. Hen’s fed darker color feeds like green plants, corn and alfalfa produce eggs with darker color yolks. Blood or meat spot – indicates rupture of a small blood vessel(s) in yolk at time of ovulation, or deposit of tissue during egg formation. Green ring on hard-cooked yolk – result of overcooking egg, caused by sulfur and iron compound reactions on the surface of the yolk. Off-color egg white, i.e. pink, green or iridescent – indicates spoilage due to pseudomonas bacteria, a very common type of bacteria that healthy people often carry without knowing it. This bacterium produces a greenish, fluorescent, water-soluble pigment in the egg white. If you find an egg with an off-color egg white, DO NOT EAT. Black or green spots inside the egg – indicates bacterial or fungal contamination of the egg. If you find an egg with black or green spots inside the egg, DO NOT EAT. 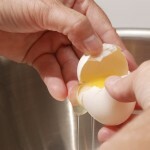 If you have additional questions visit the Egg Safety Center’s frequently asked questions. For more egg safety tips like us Facebook and follow us on Twitter!